Zeebrugge (as of 20/05) – London Gateway – Rotterdam – Dunkirk – Le Havre – New York – Savannah – Cartagena – Papeete – Noumea – Brisbane – Sydney – Melbourne – Nelson – Tauranga – Manzanillo – Savannah – Philadelphia – Zeebruge. Napier will be offered by Oceania feeder. 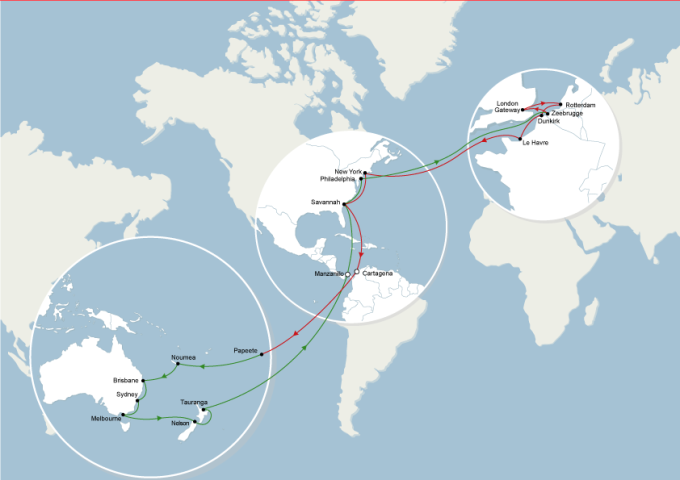 The service will be operated with 13 vessels of ~2,500 TEU nominal, with 600 reefer plugs, CMA CGM deploying 12 vessels.